I have a bunch of amazing MKV files and want to play them on my iPod touch 4 on the go, but it's not capable of doing this, can anyone shed some light on it? Have tried many software to transfer the MKV/HD MKV videos to iPod Touch 5g, but of low quality, is there any other software to solve this problem and help me out? I'd like to keep the video qualtiy as best I can. Does iPod Touch 6 support MKV video format? Can I play MKV on iPod Touch 6 without problems? Maybe you're also facing such troubles and sweating over to find a way out, luckily, now playing MKV on iPod Touch 6/5/4 is not as difficult as you imagine. Read on you'll know more about iPod Touch 6 MKV video playback and we will share you the best way to put MKV files on iPod Touch 6. MKV, short for Matroska Video, is commonly used for high-definition video files. It's increasing in popularity and likely to become the leading video container for HD videos. Nowadays, box-office movies that delivered over internet are widely in MKV format. As one of the hottest portable devices on the market, iPod Touch supports MPEG-4 (MP4), M4V and MOV with some certain limitations. 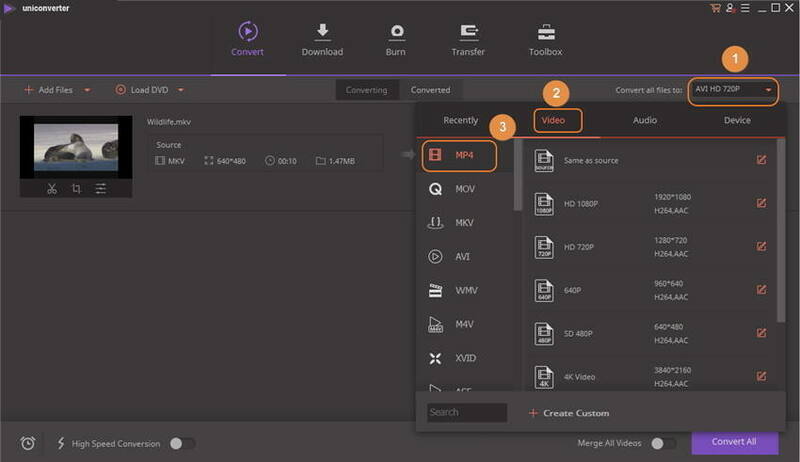 Without mincing words, we'd like to recommend you a powerful and trustworthy video converter directly-Wondershare UniConverter (originally Wondershare Video Converter Ultimate), which features on powerful video conversion capability and ultra fast speed (30X faster conversion). Moreover, it provides an optimized preset for iPod to make your MKV to iPod task even easier. First of all, download and install this professional MKV to iPod converter to your computer, then follow the detailed instructions below. Note there're Windows and Mac version for your selection, make sure you're downloading the right version and this article takes Windows version as example. 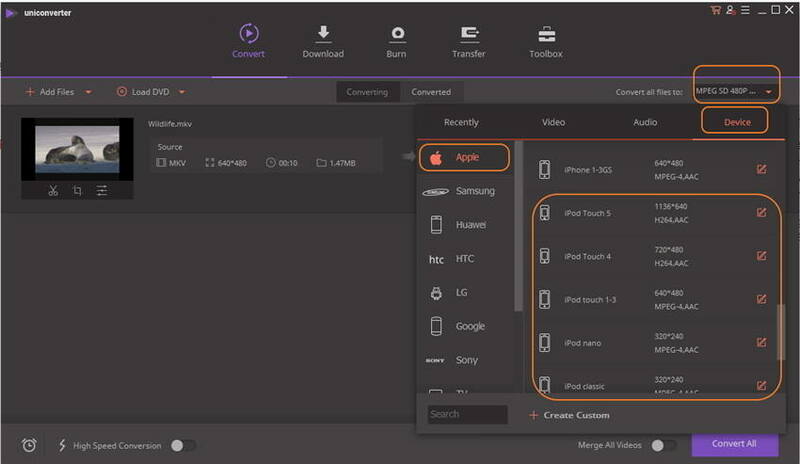 Launch Wondershare MKV to iPod video converter, then drag and drop your MKV files directly into the main interface to import them to the software, they'll show as thumbnails. There you can adjust the video order, assign the output file name and preview converted iPod-supported videos. 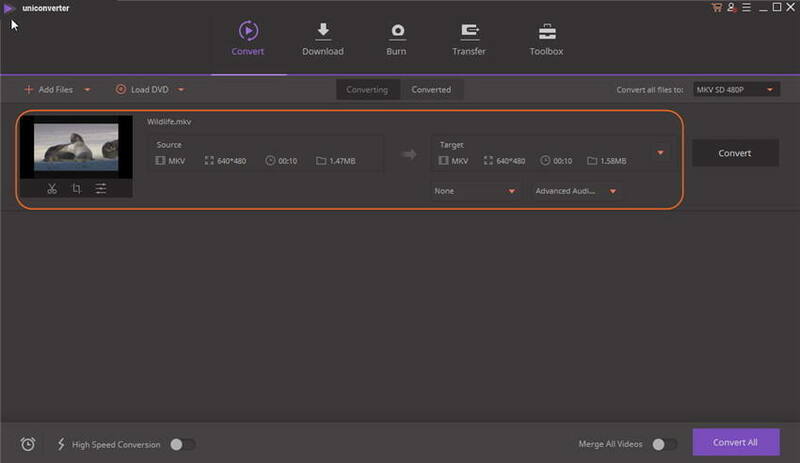 Click the drop down list of Convert all files to and there're a variety of video and audio formats to choose from, then select one from the pop-up format list. Here you'd choose MP4, M4V(iPod-friendly formats) under Video. Or you can also Choose presets for your Apple Devices (the optimized presets usually work great). Apart from the essential converting functions, Wondershare MKV to iPod converter also enables you to enhance your converted MKV videos before being transferred to iPod Touch. Click edit options below the chosen videos then a window would pop up where you'll find editing tools like Trimming, Cropping, Video Adjustments, Subtitle and Watermark available for use. Having all settings and customizations done, hit Convert button to start MKV to iPoad conversion. And you can tell the remaining time through the progress bar.